The biggest earthquake to hit Japan in 140 years struck the northeast coast on triggering a 10-metre tsunami that swept away everything in its path, including houses, schools, cars and buildings. Utter devastation and the imminent threat of a nuclear disaster we have all seen the frightening images of the earthquake, tsunami and fires. The death toll keeps climbing and more than that, the worst is yet to come. With the current nuclear disaster the size and scope of Japan’s disaster continues to unfold. 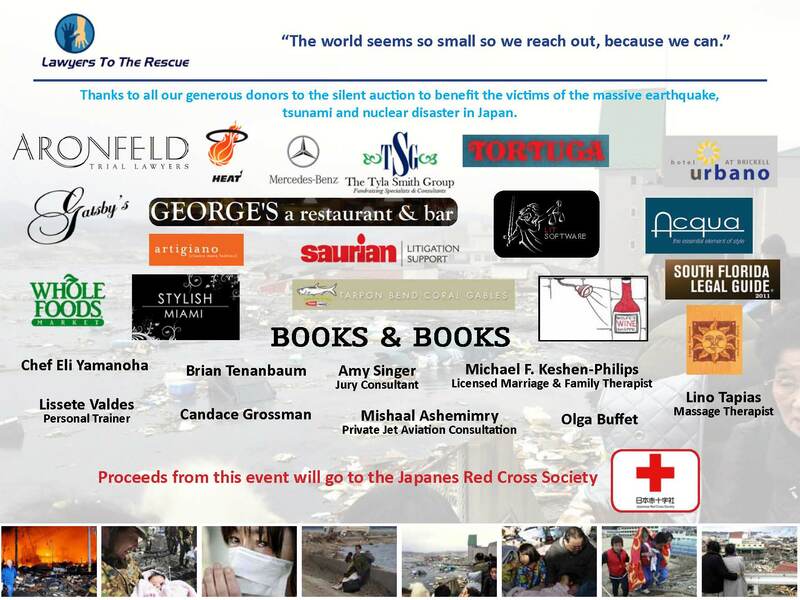 Lawyers to the Rescue and its members went work putting together a fundraiser to benefit the victims of Japan’s tragic events. The response was overwhelming many immediately contacted us and donated items and services to the silent auction. Donation include Miami Heat thickets, Salvador Dali Painting, Restaurant dinning certificates, Mercedes Watch, gift baskets, wines, gift cards, red carpet party, a number service consultations, messages, custom made shirts and much more. The event venue and all the profits from the dinner were generously donated by Sakura Coral Gables Japanese restaurant. The event was a success thanks to all the generous people who donated, participated and attended this event.